March 1937. Paterson, New Jersey. "Textiles. Bachelor shacks in outskirts of Paterson, on Molly Jan Brook. About 25 men live here now (some of them old silk workers) and stay here all winter. Man in one view worked in silk up to 5 years ago. On relief now." Photo by Lewis Wickes Hine. View full size. Submitted by Vidiot on Mon, 03/25/2013 - 2:44pm. The citizens of West Hempstead would be wise to forget "Mayfair Park" and choose more pragmatically... maybe "Wuthering Hills", or "Whiskey Hollow". That's the formula both East and West Paterson used: Keep the initials the same, and you'll save a bundle on re-embroidering cheerleader uniforms ("EPHS") or changing the initials on traffic cones and road barricades. Now THAT'S the Joisy way. Submitted by Vonderbees on Mon, 03/25/2013 - 1:53pm. Upon further research, it appears that a major intersection in Paterson is Market Street and Park Avenue. I'm thinking that someone moved the signs as a bit of humor in an otherwise dreary environment. Submitted by Desdinova on Mon, 03/25/2013 - 11:16am. Follow up to Peter, West Paterson, NJ changed its name to Woodland Park, NJ about 2 years ago citing the same reasons as East Paterson/Elmwood Park did. That said, Paterson, NJ is a very large city and has seen some improvement in many areas in the past 40 years, which is something I suppose. Submitted by Flatbush on Sun, 03/24/2013 - 9:04pm. Lou Costello was from Paterson, New Jersy and even did "asides" in some of his movies to mention his home town in New Jersey while Abbott wasn't looking. Submitted by Vonderbees on Sun, 03/24/2013 - 2:49pm. I'm still trying to figure out how the street signs got there. Submitted by Joe Z on Sun, 03/24/2013 - 1:07pm. That's the Molly Ann Brook, not Molly Jan. The Molly Ann Brook is a tributary that enters the Passaic River upstream of the Great Falls and just a few blocks from historic Hinchliff Stadium. Where it enters the Passaic the brook is the boundary between Westside Park and New Bridge Landing Historic Park. Submitted by Peter on Sun, 03/24/2013 - 8:30am. The last half-century or more hasn't been kind to Paterson. In the 1970's the residents of next-door East Paterson spent a considerable amount of money and waded through a great deal of red tape to change their community's name to Elmwood Park. 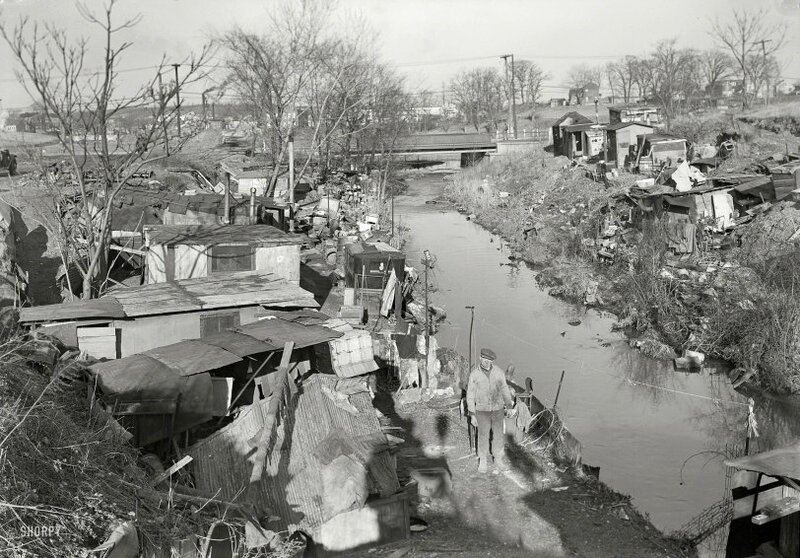 The reason for this effort, which the residents weren't embarrassed to mention, is that even 40 years ago the very name Paterson had become synonymous with poverty and economic decline, and they feared their community would suffer if its name weren't changed. There are ongoing efforts by the residents of West Hempstead, New York to change their community's name to Mayfair Park, for pretty much the same reason. Submitted by Bob100 on Sun, 03/24/2013 - 8:26am. This makes me appreciate our little bungalow a lot more.